It’s a question I hear surprisingly often and since I travel extensively to track business developments in the wine industry, I do have access to information that enables and shapes my answer. The “short list” of where I’d personally invest in vineyard land has held steady at precisely two regions for several years now. First is Switzerland — it’s a steep buy-in, certainly, but my bet would be on the long-term domestic wine market, which for historical and cultural reasons consumes nearly everything they produce. Second is Tasmania, whose producers command up to four times the price for grapes as other regions of Australia. I’ve recently added a third region to my list: Idaho. A few weeks ago I walked a vineyard in northern Idaho alongside a long-time player within the agricultural space of the Pacific Northwest. We came to the end of a row, turned away from the vines, and looked out toward vast amounts of open space and rolling hills — vast amounts, that is, of unplanted, undeveloped, prime agricultural land. “How much of this is plantable to vines?” I asked, gesturing. We stopped walking. It sounded like a grandiose statement, but it came from someone who’d know how to judge its viability. I turned to him and paused for a moment. “Have the big wine companies come knocking, looking to buy?” I asked, mindful of the very high cost of land and water for wineries in California in particular. Here are three very good reasons why those companies (and anyone interested in vineyard real estate, for that matter) are watching. Vineyard landscape in Idaho is just over the border from the vineyard landscape of Washington state. But that’s an arbitrary political border, and just because it’s labeled “Idaho” doesn’t mean it’s any less of a quality wine producing region that’s labeled and recognized as “Washington.” It’s a difference in nomenclature, but the reasons why grapes grow well there are the same reasons why grapes grow well here. Two of those reasons are the area’s very long history of agricultural skill and knowledge, and the weather, which keeps vine viruses and pest pressure to a minimum. 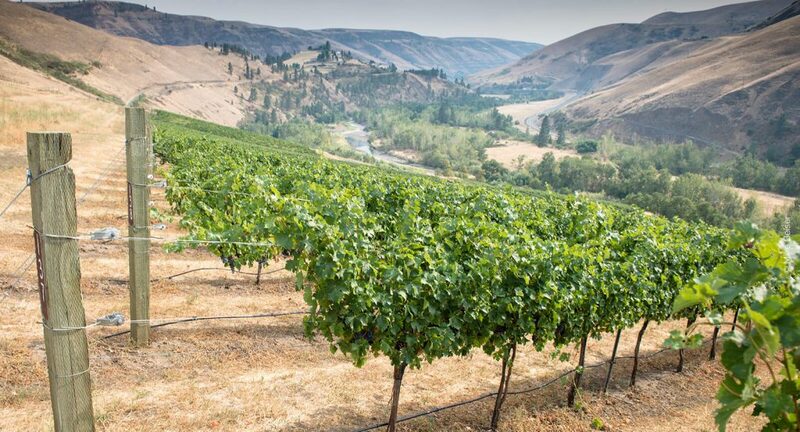 The brand new Lewis Clark Valley AVA (American Viticultural Area) was designated in April, just a few months ago, and it joins the Snake River Valley and Eagle Foothills AVAs. The designation process requires extensive research and documentation as applicants “make their case” for official recognition of a unique set of climatic conditions, such as steeply sloping canyon walls and an altitude breaker (grapes grown above that line are no longer within the AVA). In addition, the Idaho State Department of Agriculture recently awarded a grant of $139,000 to Boise State University researchers Nancy Glenn and Alejandro Flores to develop a web-based tool that helps producers evaluate the suitability of soils for specific grapes, from Tempranillo to Syrah to Riesling, within the Snake River Valley AVA. Note: Today’s post about the wine industry in Idaho continues our series on the lesser-known regions and grapes that are increasingly gaining traction within the U.S. They’re gaining traction for at least three reasons: the geographical boundaries of wine production globally are expanding; a growing amount of research is dedicated to varieties that work well within those zones of expansion; and, in addition to a strong desire to eat local, consumers are also realizing the potential to drink local too. Whether it’s high-altitude viticulture in Colorado or wine growers in Idaho, the developments and the trends from these lesser-known regions are worth watching. Reprinted from Cathy Huyghe is the co-founder of Enolytics, and the author of Hungry for Wine: Seeing the World through the Lens of a Wine Glass. Find her online at cathyhuyghe.com.